The leadership PAC of Rep. Adam Schiff (D., Calif.) appears to be on pace to spend more in the 2018 election cycle than it did in all of its six previous House election cycles combined dating back to 2006, according to campaign finance data available from the FEC and ProPublica. One longtime California Republican political operative who once campaigned against Schiff says it more than likely marks the beginning of a run at a leadership position, especially now that those ranks among the Democrats have been shaken up by Joe Crowley's loss in New York—Crowley served as the chairman of the House Democratic Caucus. Meanwhile, Minority Leader Nancy Pelosi's continued grasp on the top leadership spot remains very uncertain. In the previous six House election cycles, "USA PAC—United for a Strong America" doled out a combined total of just over $264,000. After the latest filings for the present cycle that includes all activity in June, the PAC had spent a little more than $233,000, with most of those donations going to just about 70 Democratic candidates in competitive House races. If the dating of the disbursements on FEC data is accurate, roughly 70 percent of the donations from Schiff’s PAC to the other candidates came within two to three days after Crowley’s loss. In addition, the California congressman has been busy working for the party's efforts as a whole to retake the majority. As Politico‘s "California Playbook" newsletter reports, Schiff has also raised over $3.5 million for the Democratic Congressional Campaign Committee. While the grand total of the figures from his own leadership PAC may pale in comparison to the joint fundraising committee of House speaker Paul Ryan or House minority leader Nancy Pelosi, all of these elements in the aggregate show a candidate who is now reaping a fundraising harvest from nationwide elements for his leading role in pressing back on the Trump administration from his perch as the ranking Democrat on the House Intelligence Committee. Jason Roe managed the Republican campaign in 2000 against Schiff and says the sharing of the wealth to so many swing races definitely looks like the beginning of a campaign for a leadership spot. "I think it's a two-fer," Roe told the Washington Free Beacon. "One, he's ingratiating himself to the candidates who are running, and two, showing his colleagues in his caucus that he's doing some lifting for the team." "A run for House speaker might be a little bit ambitious, but I could see him going for leader, whip," said Roe, adding that the congressman's barrage of TV appearances would also pad his résumé with colleagues. 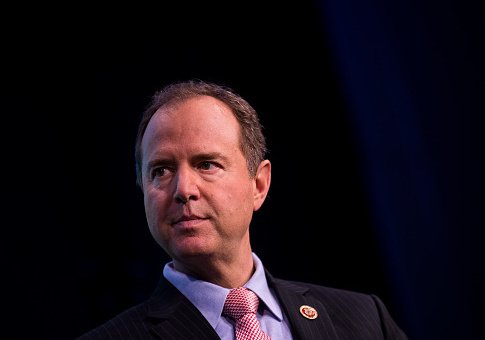 As one might expect for a congressman who represents the Burbank area just north of Los Angeles, Schiff's fundraising through his leadership PAC has gathered support from Hollywood types like Chelsea Handler and Judd Apatow. But the out-of-state donations also include many political heavyweights, like Slim Fast founder S. Daniel Abraham from Florida. From Colorado, Schiff has received support from high-powered lawyer and lobbyist Norm Brownstein, as well as from Pat Stryker, a mega-donor for Democrats in Colorado politics who also served as an Obama fundraising bundler in 2008. The Soros family, George along with son Alex, have also given to Schiff this cycle. Schiff also made the move in 2017 to create a joint fundraising committee, which, according to the Center for Responsive Politics, "can be created by two or more candidates, PACs or party committees to share the costs of fundraising, and split the proceeds." In this case, Schiff has created a joint committee—Schiff Leads—that can fundraise simultaneously for his candidate committee and his leadership PAC. Schiff's "United" PAC still has $90,000 cash on hand, while the joint fundraising committee has about $10,000. Emails to the Schiff campaign for comment were not returned. This entry was posted in Politics and tagged Adam Schiff, Congress, Democratic Donors, Democrats. Bookmark the permalink.